This is a major Sibelius event in superbly clear, rich recorded sound. (...) It's as fine a Sibelius cycle as any available. (...) These are wonderful interpretations. 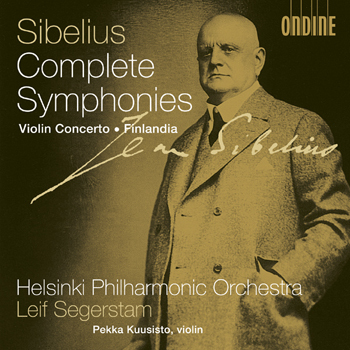 This 4-CD box contains reference recordings of the complete Sibelius symphonies, coupled with the hugely popular Vioin Concerto and the famous orchestral piece Finlandia. The Helsinki Philharmonic Orchestra, which played Sibelius's music under the composer's baton, and chief conductor Leif Segerstam have unrivaled credentials in the performance of Sibelius's music. Starring in the concerto is young violinist Pekka Kuusisto ("may be the best thing to happen to classical music" - The Guardian, 16 January 2007), who recorded the famous work shortly after winning the Sibelius competition in 1995. This recording, originally relesead on Pekka Kuusisto's acclaimed first disc on Ondine, won The Music Industries Association's 'Annual Award for Excellence' in 1996 and became an international bestseller (ODE 878-2).